Real estate of Islamabad has seen tremendous growth over the past few years. During last 10 years, property prices in Islamabad have approximately doubled. Given this positive trend, many individuals are keen on buying a house, flat or plot in Islamabad or Rawalpindi. A rightly selected and bought property is a secure and financially rewarding investment. Purchasing the right property makes it easier to rent out and sell whenever you want. Comparing different housing schemes is an initial step. One have to consider many aspects while selecting a property for purchase e.g. location, price, payment plan, resale value, security and management of the housing scheme, infrastructure (roads, street lights, boundary wall), availability of basic necessities (electricity, sui gas, telephone), reputation of the builder and developer. You should also ask the seller about any development or hidden or charges. But above all of these is the legal status of the housing scheme to avoid possible legal complications and frauds. You must verify the legal status of the housing scheme in which you are investing. Check whether the housing society is registered from the relevant development authority; i.e. CDA in case of Islamabad and RDA in case of Rawalpindi. There are dozens of illegal housing schemes in Islamabad. Many times CDA has published in newspapers, list of illegal housing schemes in Islamabad where these housing schemes are operating without acquiring formal approval and NOC from CDA. CDA published these notice for awareness of public, but it doesn’t make much difference, mainly because it does not reach to all citizens. Disclaimer: This list is taken from CDA website on 21 November, 2018. Updated details of approved housing societies in the capital territory can be acquired from CDA. Disclaimer: This list is taken from RDA website on 21 November, 2018. Updated details of approved housing societies in the capital territory can be acquired from RDA. It is also worth mentioning that name of new housing schemes will be updated on CDA and RDA websites, you can visit their websites for updated information. 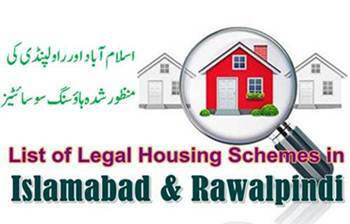 Moreover, the housing societies in Islamabad will get NOC from CDA while housing societies in district Rawalpindi will get NOC from RDA and/or the relevant Tehsil Municipal Authority.